the culprit to be one Charles Schumer! 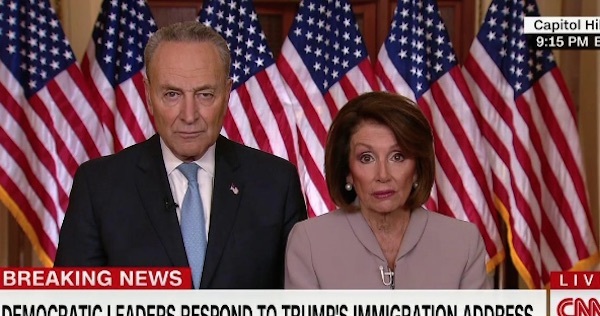 That’s right…”Chuck & Nancy” are nervous and crapping all over themselves! The reporter neglected to mention where the handful of “mud” hit old Nancy! I can hope that her mouth was open and that Donaldus landed it right on her kisser! Yankee Mike: A pissah in the kissah. DJT is the smartest person in any room. If Dumb and Dumber think they can outsmart and outlast the Donald, they’re delirious and will be out-flanked every time. The beauty of canceling their little trip was a work of art, only to be rivaled by a Remington or Monet classic. So the two Beltway buffoons think that State of the Union security is less safe than that in Afghanistan? No more needs to be said.